Try this fall twist on a favorite brunch recipe! 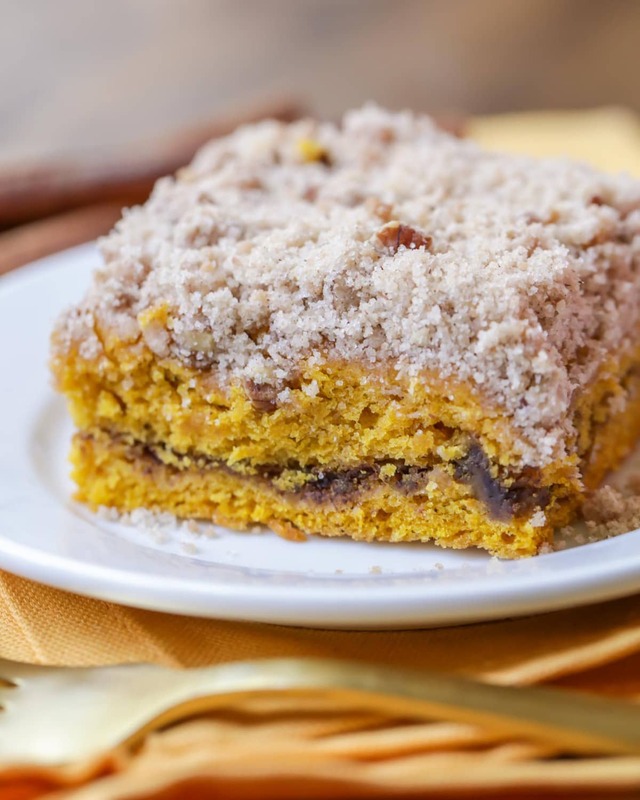 This delicious Pumpkin Coffee Cake has a moist pumpkin cake base, brown sugar filling, and the most amazing streusel topping made from butter, pecans, cinnamon and sugar. 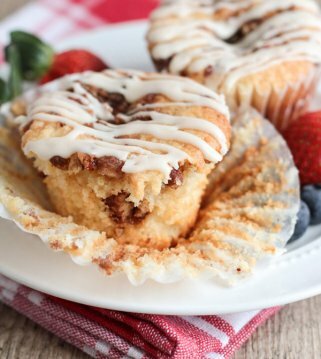 It’s the perfect fall treat for get togethers, brunches, and weekend breakfasts! 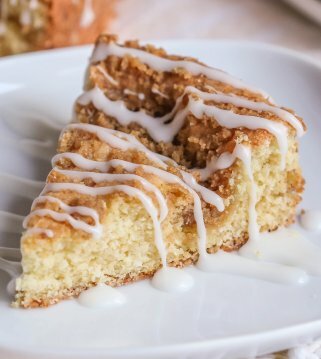 Who here loves COFFEE CAKE? I remember my mom making it for me before I went to a summer camp as an early teen. I can’t remember ever having it before that, but once I tried it I was hooked. Maybe it’s something about butter, cinnamon and sugar that is so addicting, but I knew I loved the recipe. When I saw a Pumpkin Coffee Cake version from King Arthur Flour, I knew we had to give it a go. I had a feeling the recipe would be full of all the fall flavors everyone loves and would be a hit served as a coffee cake. I’m glad we ended up trying this recipe, because it was indeed a hit! 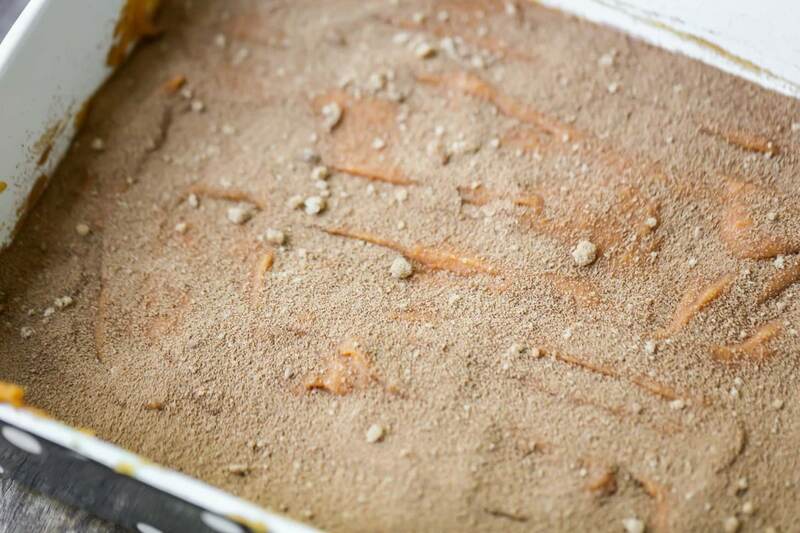 With cinnamon and sugar and pumpkin flavoring, we really couldn’t go wrong with this recipe. We ended up making a few changes to make it a little more moist and loved that it came out perfect. 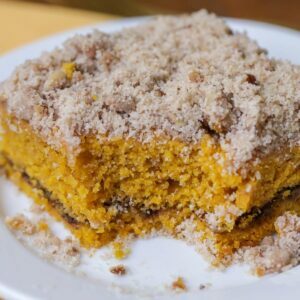 This is definitely another recipe to try this fall, especially if you’re a pumpkin lover, and it would be perfect for brunch or even a baby or bridal shower. Just be sure to have napkins because there was plenty of cinnamon and sugar on top! Check out that streusel on top! You can add less if you like but we loved that the pecans, cinnamon and sugar were the perfect topping for this coffee cake. 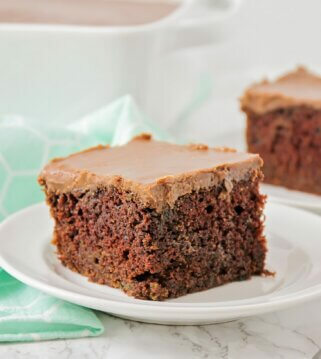 Spread half of the cake batter into a greased 8×8 pan. Next sprinkle the brown sugar filling over the cake batter. Add remaining batter on top of the brown sugar filling. 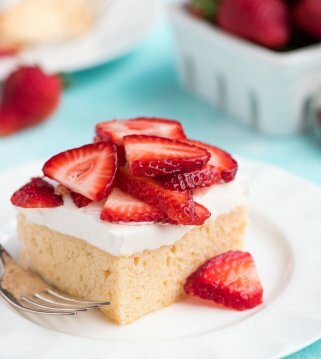 Use a knife to gently swirl the filling into the batter. 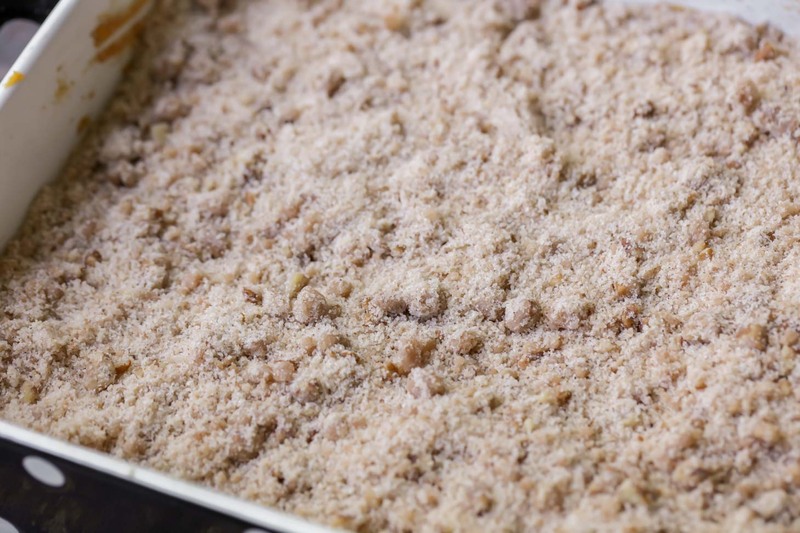 Sprinkle on the streusel topping. Once everything is layered, pop in the oven and bake at 350° for 40-45 minutes. Cool slightly before serving, and ENJOY! I told you there was lots of cinnamon and sugar on top. 😉 We’ve made several different pumpkin “cakes” over the years and we definitely think this one is a keeper. It just screams fall time and is so scrumptious, it’s sure to not last long in your home. 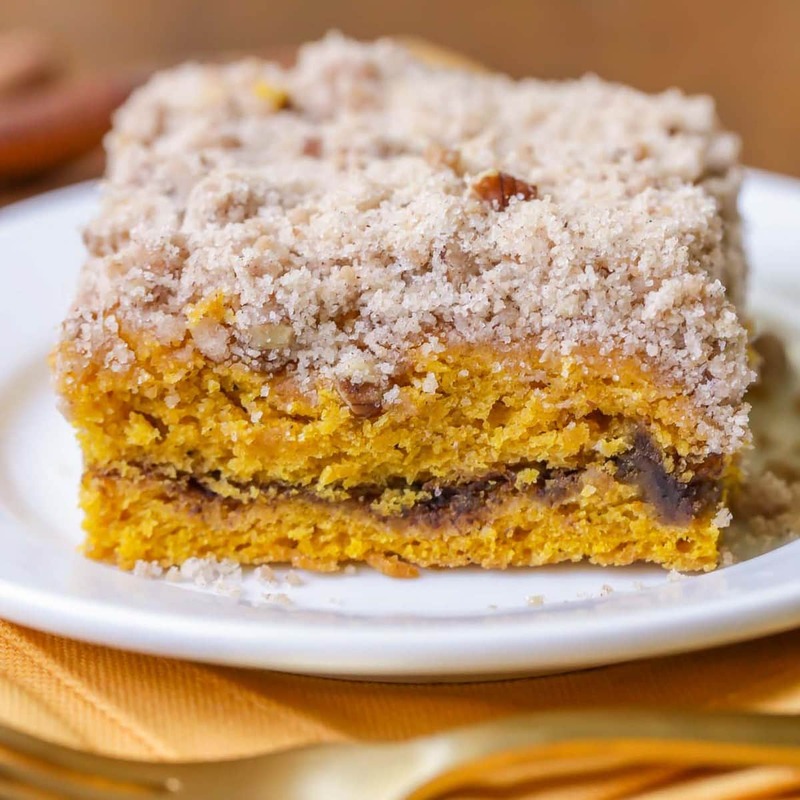 Delicious Pumpkin Coffee Cake with a brown sugar filling and topped with butter, pecans, cinnamon and sugar making it the perfect fall treat! In a medium bowl, whisk together sugar, salt, flour, spice and nuts. Add melted butter and stir until combined. Set aside. In another bowl, mix together brown sugar and spice. Set aside. To make cake, beat together oil, eggs, sugar, pumpkin, spices, salt and baking powder until smooth. Add flour and stir until smooth. 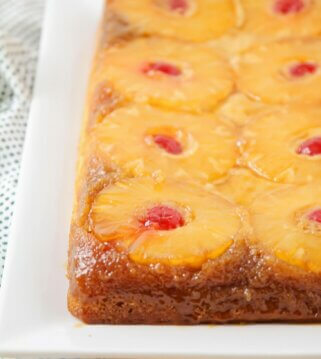 Spread half of the cake batter into a greased 8x8 pan. Sprinkle brown sugar and spice filling over cake batter. Add the remaining batter on top of the filling. Use a knife to gently swirl the filling into the batter. Sprinkle on the topping and bake for 40-45 minutes. 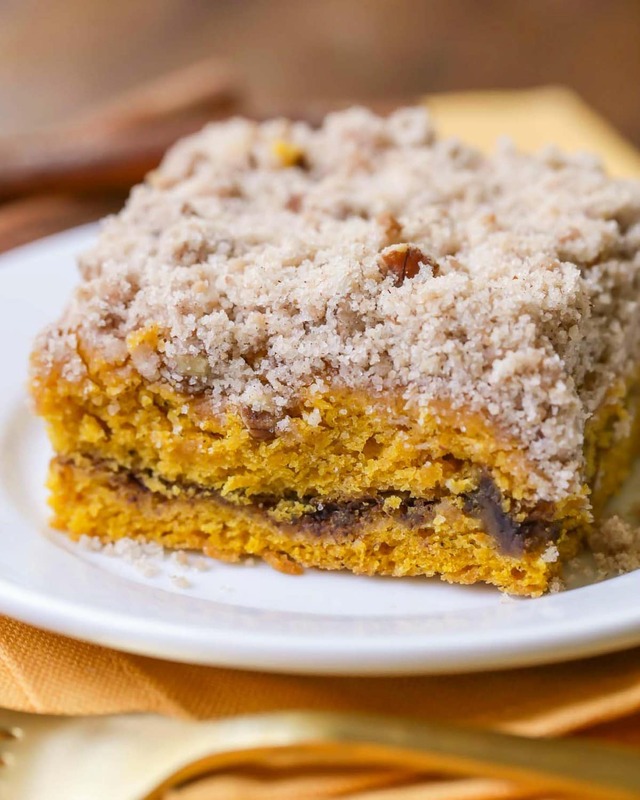 This pumpkin coffee cake is amazing. Thanks for sharing it. I agree 🙂 You are so welcome!! Thank you! Nice tweak to, at least the coffee cake version that I’m used to, love that you’ve added pumpkin here! Not just for Thanksgiving, I think pumpkin is under-utilized during the rest of the year, so thank you for giving it it’s due here! I agree! Pumpkin needs to be used more throughout the year 🙂 It’s so good! No problem 🙂 http://allrecipes.com/recipe/20477/pumpkin-pie-spice-i/..hope that helps you!! These look super easy to make, thanks for the idea! It looks yummy! I have never tried PUMPKIN coffee cake before. 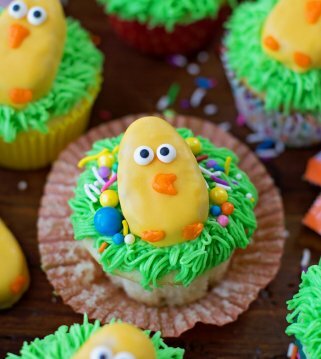 I will make one if I have time next week. Thanks, KRISTYN! You are so welcome!! You have to try it, it is so good!! Let me know what you think, if you do try it!